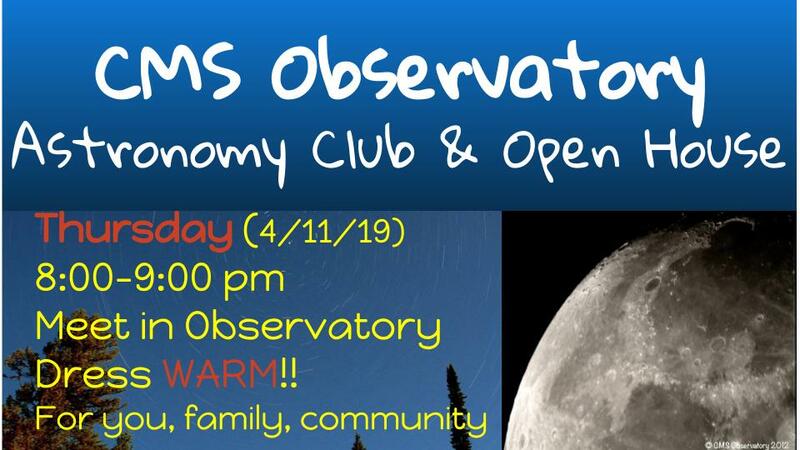 Oct. 18 7:30 - 8:30 pm Grand Reopening of the CMS Observatory!! Dec. 13 7:00 - 8:00 pm Comet hunting - we will look for comet 46P/Wirtanen . Click HERE for a good video clip on the comet. Jan. 20 8:30 - 10:00 pm Sunday night 0pen house to view the Total Lunar Eclipse. Click HERE for eclipse information. The CMS Astronomy Club was started in the winter of 2007/8. Since that time CMS students and families have been meeting approximately monthly during the school year. Listed below are the meeting times for this school year. Students, families, and the public are welcome to participate. Essentially, we have an open house each month! We meet in the observatory in the back of Cody Middle School. For more information, please contact Pete Idema (pidema@park6.org), Mike Denning (mdenning@park6.org), or Amy Carpenter (acarpenter@park6.org) at CMS.